Whle the summer months require light fibers of cottons and linens, the winter months are all about layers. Winter is when the wonderful fibers of tweed and wool come into their own. Tweed immediately evokes a vintage-inspired style, with only a few details needed in order to complete the look. In today’s article, I will explore some options for men’s vintage clothing for fall and winter. For men desirous of dressing in a vintage style, it is the cooler months that may provide the simplicity and relief of comfort. Buttoned shirt collars adorned with cravats, waistcoats of tweeds and wools, long shirt sleeves finished with cufflinks – these details all lend themselves perfectly to the cooler months of fall and winter. With the cooler temperatures comes the opportunity to employ various layers. Shirts may be teamed with sleeveless sweater vests or cardigans for extra warmth. Alternatively, a waistcoat / vest may be worn in the place of a sweater for a more formal look. As afore mentioned, tweeds and wools are absolutely perfect for cold weather. Tweed is inherently associated with British outdoor pursuits. The fibers and weaves of tweed render it an excellent choice for outdoor wear. Tweed is moisture resistant, long wearing and retains heat. From Edwardian times through the following decades, tweed was fashioned into men’s plus-fours (knickerbockers), Norfolk jackets, and various sporting garments. Shop tweed clothing here (men’s and women’s). Due to the popularity of tweed during the early twentieth century, today it may immediately emulate a vintage-inspired style. Look to the annual Tweed ride or Tweed run events for outfit inspiration. Below Oscar wore a vintage reproduction plaid wool bicycling riding suit with shorts, pullover fair isle sweater vest, button-down shirt, bow tie, argyle socks, 8 panel tweed cap and oxford shoes. Team a tweed jacket with a smart waistcoat, high-waisted trousers and a tailored shirt for a perfect vintage inspired fall look. Autumn and winter are the perfect months in which to don a beautifully crafted knitted garment. Knitted garments had of course been popular for hundreds of years; however their popularity increased in the early twentieth century. Knitwear can be both stylish and practical. Choose a variety of sweaters, cardigans and sweater vests in plaid chunky knits or vintage patterns like argyle or fairisle. With the new trend for leisurewear, sweaters and knits were chosen for sporting activities. Jersey and silk knits were simple, unstructured garments – thereby providing the wearer with freedom and ease of wear. Both wars saw an increase in knitting, mostly through women’s groups contributing to the war effort. 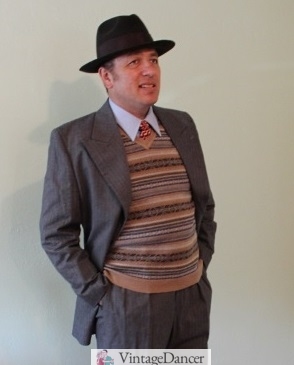 For men, the pullover or sweater vest was popular. Usually featuring a V neckline, this sleeveless garment would be worn as casual or leisurewear during the 1920s up to the 1950s. Cardigans and sweaters were also popular during this time, with many women’s knitting magazines containing patterns which to produce them by. One of the most popular patterns of the period was Fair Isle. The style originated from its namesake, Fair Isle being an island located in the North of Scotland. The term today is generally used to describe the recognizable pattern design. The pattern can be a formation of hexagons, squares, circles and crosses, among other various shapes. In the early 1920s, Fair Isle knitwear reached elevated status. The Prince of Wales, Edward VIII, wore the patterned sweater for golfing and leisure activities. For more information on Fair Isle, and some interesting pictures, . For a classic men’s vintage inspired look for fall and winter, layer a shirt with a Fair Isle patterned knit. Finish the look with classic cut 1940s style pants. For days when the temperature is proving particularly chilly, finish the look with a tweed jacket or overcoat. Whilst sportswear and leisurewear were increasingly popular during the first half of the twentieth century, these styles retain a formal element to the eye of today’s consumer. However, casual styles of dressing did indeed derive from the increased demand for leisurewear. For a mid century casual style, team a pair of jeans with a warm knit sweater and plaid jacket. For a men’s casual vintage inspired style, classic denim jeans are perfect for creating a mid-century look. Although jeans were worn from as early as the late nineteenth century, it was the youth rebellion of the 1950s that popularized this item. The enduring appeal of a garment lies in its ability to be functional and practical. Jeans are a testament and perfect example of this observation. Initially worn as work wear, jeans were designed to be durable, hard-wearing, and above all practical. For a mid century style, team a pair of classic cut jeans with a chunky knit cardigan and harrington, bomber or denim jacket. Of course, whilst furnishing oneself with many layers of tweeds, wools, or denims, winter accessories are essential to keep out the seasonal chill. For a formal style, opt for a scarf of finely woven wool fibers. There is an abundance of colors and patterns currently available to choose from – one for each outfit! Gloves are perfect for keeping hands and fingers encased in warmth. Perhaps especially essential for driving ones vintage (pre-heater era) motorcar. Finish a vintage look with these great autumnal accessories in plaids and checks. Perfect for keeping warm and stylish! Hats finish any outfit, whether the climate is warm or cool. For winter, choose a hat of cozy fabric, and be mindful of any styles likely to get blown away by inclement autumnal breezes. And lastly, in addition to hats, scarves and gloves, an umbrella may be a handy acquisition. Perhaps with brimmed hats the need for an umbrella may not be great, due to the hat brim at least protecting the face. However, to ensure ones outfit is protected from any sudden downpours, an umbrella is the perfect autumnal accessory. Shop men’s accessories. Whether tweeds, Fair Isle, jeans or wools are your choice of autumnal attire, you can be sure to find a style to create a perfect vintage look for men.